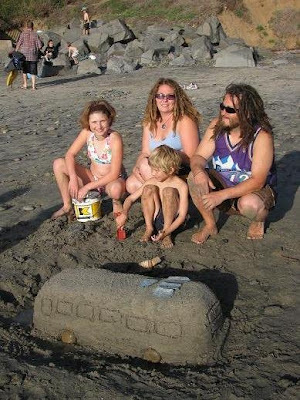 Bryce's sister and her family came out for spring break to go to Disneyland and see the beach. We met up with them for beach time at Huntington Beach and dinner at Disneyland. The kids love it when they get to hang with their cousins. We next moved on to LA. We got to hang out with my super cool cousin, Ryan! He had us over to BBQ & swim one day. Our kids have decided Ryan has the coolest job ever! (He's in film) And they kept trying to get him to take them to work with him so they can watch new movies. He met up with us another day too at the LeBrea Tar Pits which was really interesting and FREE one day a month, which happened to be the day we were there. A must see if you are in LA! There is tar still bubbling up from the earth. not really what you expect in the middle of LA! Lots of really cool ice age fossils of huge sloths, dire wolves, mammoths and lots of others! There is an open excavation pit where you can watch them work too. We boondocked right across the street from the pits. Nothing like free camping in LA! Where we stayed for a few days in L.A. Right next door, on the same block is the big LA Art Museum (can't remember the real full name??) It is free (donations) after 5pm. We only got to see 2 of the buildings, before our kids good behavior had expired. LOL! Steve took pictures of some Picasso's, umm yeah they yelled at him, cause no photography was allowed. Then we snuck and took some pictures of some Jackson Pollock's (he's a relative of Steve's). We also went to the Griffith Park Observatory. We parked down by the Greek Theater and watch a big coyote wonder around the parking lot. This is an amazing planetarium and it is FREE! We did pay to watch a laser show which was really cool. As it got dark we could see the whole city lit up. Great views! They also had some big telescopes out on the grass and we were able to see Saturn and it's rings.....very cool! Coyote near the parking lot at the Greek Theater. We are still trying to do catch up on our blog from the last 2 months. Sorry we've been slackers! Just playing too much to write. The end of Feb after the Families On The Road (FOTR) rally we got to hang with a few of the families for a few more days in Oceanside. The high lights for us were the beautiful beach with gold sparkles...amazing! Watching sea lions and hearing them "bark"! Sitting around the camp fire with good friends and fun jam sessions. Then we were off to Hollywood, where we met up with other friends. Hollywood....meaning the strip, was not what I was expecting. Crazy, wild, crowded and very touristy....maybe that IS what I should of expected?!? Great people watching and fun street shows! A ton of people are in costume and wanting you to take pictures of them and they expect you to tip them....pretty much they harass you. So if you ever go be prepare to avoid them or bring lots of 1$s. So we are trying to catch up on our travels. We are running about 2 months behind. So the next few blogs will be our adventures from the last little while. We spent a few nights in Joshua Tree National Park. It was a cool area, but a bit sad & stressful for us. Our beloved cat Smokey jumped ship and Burnie (our bus) broke down. We plan to head back someday to enjoy it more! So thankfully it was beautiful in Joshua Tree and the stars were amazing....cause it was freakin COLD at night, yeah ice on the INSIDE of our windows...that cold! We had no internet or cell reception and we were broke down. Some way nice guy camped across from us and came to our rescue....Matt you are the BEST!!! Thanks again! Lincoln finally pulled out this tooth that had been lose for a LONG time. Isn't he cute! The kids really loved the boulders and had a blast hiking and climbing and finding hideouts. CRAZY..... LA traffic on the way to the FOTR rally! We had so much fun at the CA Families On The Road rally! 14 families that travel full time. 40 something kids, art, hooping, making icecream, movies, drumming, guitars by the bonfire, playing on the beach, swimming, riding bikes, making great friends and amazing memories!!! Icecream with friends on the beach....yummy! DeMichaels, Sloans, & Bennets.......cool people! More hot mamas and kiddos at the Rally! How many men does it take to fix a skooile? I think we had 5 guys under there! Thanks again for helping us!!!! Shredding it up at the SK8 park! This is where Lincoln became "PRO"!! !